The learned Dr. Ahmed Naqib. For an idea on why Egypt's Coptic Christians and their churches are constantly under attack—most recently last Sunday, when a church was bombed, killing at least 25 Christians—one need merely listen to the words and teachings of some of the nation's Muslim preachers. Citing revered Islamic texts including the Koran, Dr. Naqib explained that the open display of shirk—the greatest sin in Islam, associating someone else with God, which the Koran accuses Christians of doing via the Trinity—"is the worst form of fitna, worse than murder and bloodshed." In other words, and as he went on to make perfectly clear in the remainder of the video, fitna (or discord) is not when Muslims attack Christian churches—far from it—but rather when Christians are allowed to flaunt their shirk (or "blasphemies") in churches near Muslims. Fighting that—even to the point of "murder and bloodshed"—is preferable. 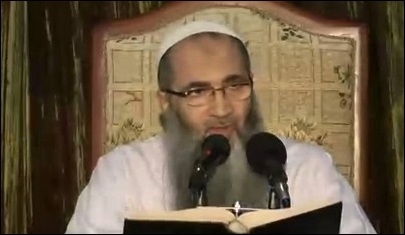 Then there's Dr. Yasser Burhami, the face of Egypt's Salafi movement, who is as well credentialed and prolific as Naqib: he's on record saying that, although a Muslim man is permitted to marry Christian or Jewish women, he must make sure he still hates them in his heart—and always shows that he hates them—because they are infidels; otherwise he risks compromising his Islam. As for churches, Burhami once issued a fatwa forbidding Muslim taxi and bus drivers from transporting Christian priests to their churches, which he depicted as "more forbidden than taking someone to a liquor bar." But it's not just "radical" or Salafi sheikhs who make such hateful pronouncements. Even so-called "moderate" Islamic institutions, such as Al Azhar's Dar al-Ifta, issued a fatwa in August 2009 likening the building of a church to "a nightclub, a gambling casino, or building a barn for rearing pigs, cats or dogs." Such analogies are not original to the Salafis or Dar al-Ifta but rather trace back to some of Islam's most revered doctrinaires, including Ibn Taymiyya and Ibn Qayyim. They taught that "building churches is worse than building bars and brothels, for those [churches] symbolize infidelity, whereas these [bars and brothels] represent immorality." Those who killed the young and vulnerable Mary Sameh George, for hanging a cross in her car, are not criminals, but rather wretches who follow those who legalized for them murder, lynching, dismemberment, and the stripping bare of young Christian girls—without ever saying [the word] "kill." [Islamic cleric] Yassir Burhami and his colleagues who announce their hate for Christians throughout satellite channels and in mosques—claiming that hatred of Christians is synonymous with love for God—they are the true killers who need to be tried and prosecuted. One can say the same thing about the suicide-bombing of St. Peter's cathedral. In short, until such time comes that the Egyptian government removes the "radical" sheikhs and their teachings from the mosques, schools, television stations and all other positions of influence, Muslims will continue to be radicalized, churches will continue to be bombed, and Christians will continue to be killed.